Compare and save thousands of dollars. We give you more for less. Spinal Decompression Therapy is a safe and effective treatment designed to help relieve your nagging back, neck, or referred pain such as sciatica. Clinical studies of non-surgical spinal decompression therapy are reporting that a high percentage of patients show significant reduction of pain. A percentage reports the elimination of pain. Thousands of people across the country are enjoying the benefits of Spinal Decompression Therapy. We are eager to help you learn if you are a candidate for this treatment method. Spinal Decompression Therapy is a safe and effective treatment for pain without the risks associated with surgery, anesthesia, infection, injections, or prescription medication. As you can imagine, decompression therapy is rapidly gaining popularity due to the exceptional results treating chronic back pain without surgery. 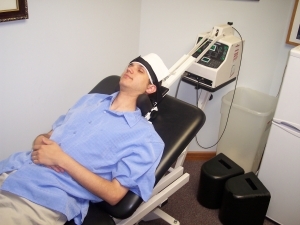 Simply described, this method of treatment uses a therapeutic table that is connected to a computer, to electronically stretch and decompress your spinal structures. You rest on the table while a padded harness focuses the gentle force along your spinal column. This decompresses your spine, specifically the intervertebral discs, and joints and stretches your spinal muscles, the three structures that produce most of your pain. Prior to beginning treatments, we evaluate you to determine if you are a candidate. If you are a candidate for therapy, an individual treatment plan is created for your specific needs. A typical plan may be between 15 to 25 treatments. It is important to complete your treatment plan and thus the full healing process even if you start to feel improvement early on. It is not uncommon to experience a significant reduction in pain early in your treatments. At the beginning of each session, you are fitted with a comfortable harness designed to offer optimal decompression. You are fully clothed, and we will make sure that you are properly positioned for comfort, safety and effectiveness. The computer is programmed in accordance with your specific treatment plan, and your session commences. Additionally, you are in complete control and can shut down the treatment session at any time if discomfort should occur. During each session, you experience multiple cycles of treatment. Each cycle takes between 2 to 3 minutes. The equipment is designed to apply precisely-controlled tension along the axis of your spinal column, creating decompression of the intervertebral discs. The process is fully automated and administered by a computer, which in turn is monitored by a technician. During the treatment cycles, you may feel some relief of the pressure in the area where your pain exists. During this time, your body is responding by flooding the area with valuable oxygen, blood, and nutrients, which help promote the natural healing process of your body. 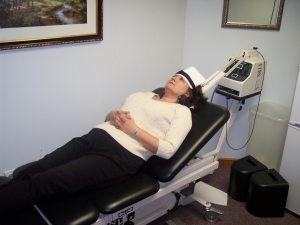 Your treatment sessions are typically both comfortable and relaxing. Most patients benefit from and enjoy their treatments.